These potatoes were good. Then, I dipped them in ranch dressing and they were So Good! Although they don't get super crunchy, they do get slightly crunchy. The thinner you can slice your potato, the more likely they will end up crispy. 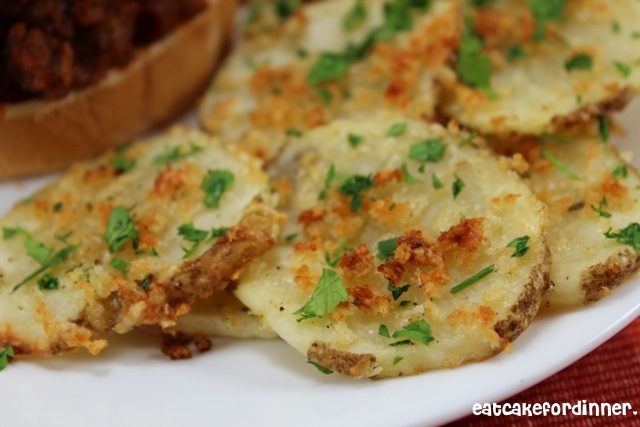 They are like little, bite-size, healthier potato skins! Imagine a bacon and Cheddar cheese version (of course that wouldn't be a healthy version). By-the-way, on a little side-note, I recently purchased a bottle of Light ranch dressing. I got the same brand that I love, but I went with light instead of original and I swear - it tastes the EXACT same. The bottle even said "I bet you can't tell it is Light" and boy is that statement true. So, if you want to save a few calories and a lot of fat grams, consider trying out light salad dressings. Either way, make these soon and be sure to dip them in ranch!!! Clean and roughly peel the potatoes, leaving a few strips of skin intact. 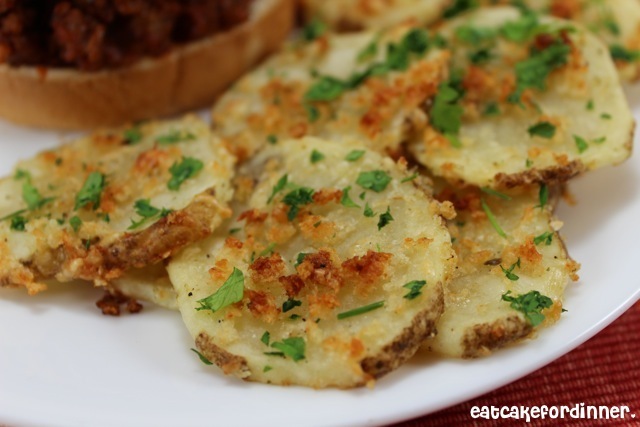 Slice potatoes into 1/4'' pieces, using a knife or a food processor. Place slices in a bowl and drizzle with olive oil; toss to coat each potato. Add the panko, parmesan, garlic salt and pepper. Stir again to make sure each slice is coated with a bit of the ingredients. Spread evenly onto a baking sheet that has been lined with parchment paper. Bake at 450 degrees for 18-25 minutes or until cheese is melted and panko are golden brown and desired crispiness is achieved. Garnish with chopped parsley and serve. Jenn's Notes: These didn't get super crispy, but they were slightly crispy. They were way good dipped in ranch dressing. I love potatoes, so glad that this is bake instead of fried. look delicious, thanks for sharing. I never would have thought to put bread crumbs on potatoes. I love seeing how many different ways people can make a potato. Do these look good. And I love anything dipped in ranch dressing! Yum! These sound scrumptious. Can't wait to try them! These look delish! This is definitely getting pinned. I'd love for you to link this up to Titus 2 Tuesdays on Cornerstone Confessions this week. Hope to see you there. These look great. I never would have thought to use bread crumbs on potatoes. Your fries look great! I love the garlic and parmesan flavor. Oooh...those sounds delicious! Would you consider linking this up at my Pinworthy Projects Party? I hope to see you there! These look amazing! Pinning and featuring tonight! Thanks for sharing at Mom On Timeout!